I had hoped to write in today’s letter that I spent today out in the garden cleaning it up and starting the process of getting it all settled for fall and the winter that is sure to follow. But the rains predicted for tomorrow seem to have arrived today, so I had to change my plans a bit. Did you know that cleaning up a garden is a delightful way to spend a day whereas cleaning up a house is a chore? At least that’s how I look at it. Anyway -- I picked the last two cantaloupe on Friday, which brings my harvest of melons to an even dozen. There is still one more small cantaloupe on the vine, or what is left of the nearly dead vine, but I don’t expect it to fully ripen. I’m still picking a few tomatoes here and there but it isn’t quite the deluge that I would have hoped for. The plants are struggling to keep going and I’ll be pulling out a few of them as soon as I can. Had it not rained today, I would have also pulled out the cucumber vines and the second planting of green beans. 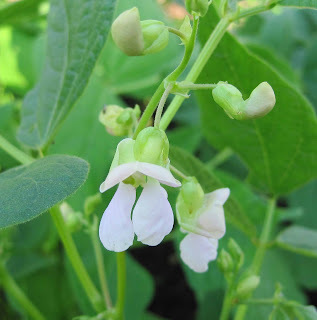 I still have the third planting of green beans to look forward to, blooming now as shown above, and there are some pole beans ready to pick, once the rain stops. I also have a few tiny rows of radishes and lettuce that I hope will produce a salad or two later this month. And there are lots of peppers waiting to be picked along with some squash. And that’s pretty much the end of this season’s vegetable garden. It wasn’t the best year for some crops but it was a great year for green beans, cucumbers, peppers, and melons. But I didn't have any problems with rabbits or raccoons, and there were very few insect pests, that I can recall, so I’m happy with my garden overall. And absolutely, I’ll plant again in the spring. I’ll always plant a vegetable garden, no matter how the garden turned out the previous year. In fact, I’m already looking forward to the arrival of the first seed catalogs so I can start picking out my tomato varieties for next year. P.S. Here’s one last look at the vegetable garden. Yes, the sun is shining. The rain I wrote of in the letter stopped and the sun came out as soon as I abandoned my gardening plans and went out to run some errands. My total rainfall was .25 inches. 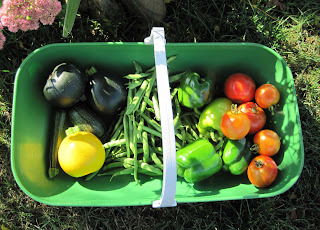 Late this afternoon, I was able to pick some green beans and a few other goodies from the garden. Thank you, Mary Ann and Dee, for this fun exchange of letters about our vegetable gardens. 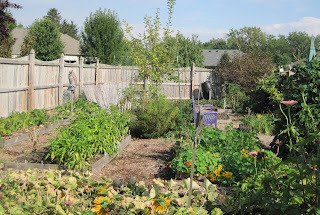 It’s been interesting and educational to compare our vegetable gardens throughout the growing season across three different hardiness zones through one of the oddest seasons, weather-wise, in quite some time. Remember how we started back on March 8th? I hope you both enjoyed this exchange as much as I did, and I hope everyone else did, too. I can't agree with you more about cleaning up a garden vs. cleaning up the house. Which is actually a good thing, as the world can see the front garden. I'm going to miss your 3-way gardening letters. It's been very interesting comparing the different climates. I love to clean up the garden for the end of the year. It makes me feel that I am ready for a rest from gardening. I've enjoyed y'all's letters and you've made me want to do more veggie gardening! It has been fun seeing you share experiences, joys and disappointments this season. It's more unsettling than fun to realize just how weird the weather has been in all three areas of the country where you garden, but since those letters come from you three, we know we are getting the facts, not baloney. Hope all your gardens are winners next season!